The Swiss jeweller Bernhard Schobinger (born 1946) uses jewellery to explore a wide range of human experiences and emotions, often with powerful undercurrents of violence and destruction. His compositions, many of which incorporate found objects, are startling for their ability to combine the lyrical with the profoundly chilling. He is particularly drawn to Japan, a country he has lived in and visits each year. The necklace, with its shard of Japanese porcelain and fragments of zinc roof tiles, refers to the dropping of the atom bomb on Hiroshima, in 1945; its title 'Hiroshima mon amour' is taken from the 1959 film directed by Alan Resnais. 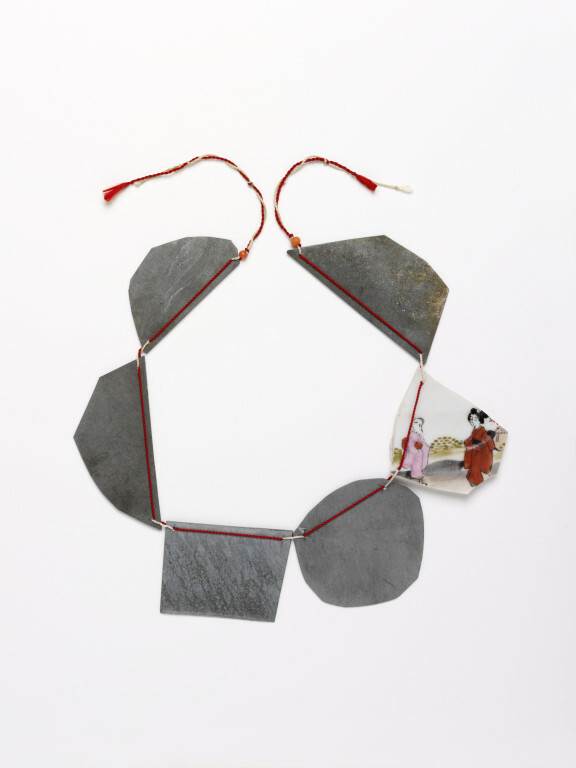 Five irregular, flat panels of metal and one fragment of porcelain painted with two kimono-clad figures are threaded on red and white twisted silk cords, with a small coral bead at each end. 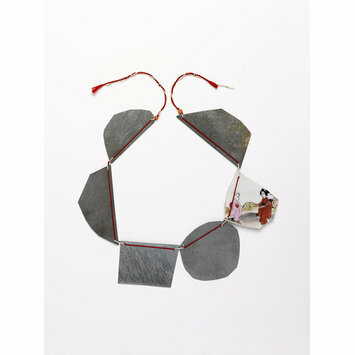 'Hiroshima mon amour' necklace by Bernhard Schobinger, titanium zinc, porcelain and silk. Switzerland, 1987.